The Three Lions visit Dublin this week. 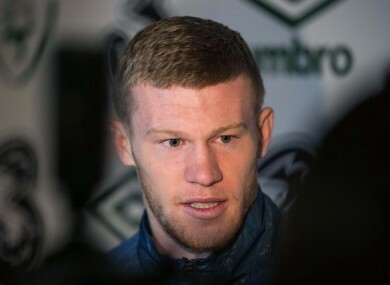 McClean hopes the game will pass off without incident. WHEN IT COMES to what happens in the stands, James McClean is all too aware of the hostilities that can exist. For one reason or another, the Republic of Ireland international has been subjected to sectarian abuse and other nasty verbal from rival supporters during his time at the top. Even in this day and age, it remains an unpleasant side of the game and while authorities continue to introduce measures to combat disorder off the pitch, underlying friction will always remain. At present, it’s an issue which remains topical as Ireland prepare to welcome England to Dublin for the first time since the infamous night at Lansdowne Road two decades ago. Understandably, the FAI have taken every step possible to ensure next Sunday’s International Friendly, if you can call it that, passes off without incident. Supporters who have purchased tickets for the 1pm kick-off must provide identification upon collection while there will be an extra police presence around Dublin 4 and McClean hopes the only talking point after the game will be the football. “Let’s hope they’re more well behaved than they were last time,” he tells The42 at the launch of a new Sports Medicine Programme. “Let’s hope the game passes by and we’re left to talk about the football and not what happens off the field or in the stands. The visit of Roy Hodgson’s Three Lions comes in the middle of a busy end-of-season schedule for Ireland. The squad meet up today in Malahide for a week of preparations, which also includes a behind closed doors game against Northern Ireland on Thursday. But the main focus will be on the crucial Euro 2016 Qualifier against Scotland on Saturday week. Defeat in Glasgow before Christmas has left Martin O’Neill’s side with an uphill task to ensure they finish inside the top three in Group D.
“It’s a huge week,” McClean continues. “The two friendlies will be very competitive and that England game speaks for itself. We all know the players from the three sides pretty well and they know us. The Boys in Green currently lie fourth at the halfway point in the campaign, two points behind their next opponents. Gordon Strachan’s side are well positioned and McClean acknowledges the significance of the game. “It’s all to play for and it’s nip and tuck up there but it’s a make or break game for us. We have the benefit of those games beforehand and we certainly won’t be going through the motions against England. On a personal level, McClean is coming off the back of a difficult season with Wigan. The Latics suffered relegation to League One and the winger has made his intentions clear that he wants to leave the DW Stadium this summer. A move to Major League Soccer has been speculated upon while some reports suggest Newcastle could be keeping their eye on his availability but McClean remains focused on the job in hand. Email “James McClean on England fans: 'Let's hope they're more well behaved than last time'”. Feedback on “James McClean on England fans: 'Let's hope they're more well behaved than last time'”.